This is a popular French pastry filled with almond cream that celebrates the holiday of Epiphany on the 6th of January, the visitation of the Magi to the baby Jesus. This is a very popular tradition all over France among friends, work colleagues, family and at school. A “fève” – it used to be a bean, now a small figurine – is hidden in the galette before baking. The lucky person who gets the “fève” is crowned king or Queen and chooses his/her King or Queen among the other guests and gets to wear a crown. Watch for that fève when you bite into it. Enjoy! If using frozen puff pastry, leave the puff pastry at room temperature for about 2 hours until defrosted but still cold. Otherwise 5-10 minutes will suffice. Line a baking sheet or pizza pan with baking parchment or grease the pan and lightly sift flour on it. Shake off any excess flour. Roll each sheet of pastry into a circle about 12 inches across. Place one circle on the prepared pan. Mix 1 egg with the almond paste until smooth and spread the mixture evenly on the prepared circle of pastry, leaving a border 1 1/2 inches wide all around. If you have a small china figurine, insert it into the almond mixture (or use a bean). Place the second circle of pastry on top and press it down tightly around the rim. Beat lightly the remaining egg and brush it on the top of the cake. With a long-bladed knife, press lightly but firmly through the egg glaze marking a crisscross pattern. Bake for 20–25 minutes until golden and puffed. Do not touch it for at least 15 minutes, as the pastry may collapse. Serve slightly warm or at room temperature. 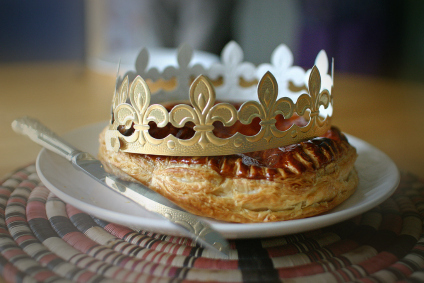 Traditionally the galette is topped with a golden paper crown, which is given to the person who finds the” fève”.